Often I’m asked by clients, “What do you do when you get hurt?” Unfortunately I did get hurt a few weeks ago, so I have a fresh example of what professional care I seek and what home care I perform to treat my injuries. deformity to the injury area. I was tender to the touch on the lateral maleoleus (the bony bump on the outside of the ankle) and along the bottom third of the fibula (outside lower leg bone). I could put weight on my leg, but it was painful. I performed a few orthopedic assessments to rule out ankle ligament ruptures or Achilles tendon tears (I know most readers won’t know how to do this, but if you have some special skills, you should use em’). I knew I did not need immediate medical attention because of the lack of bleeding, or deformity, and because of my ability to move my leg and bear some weight. 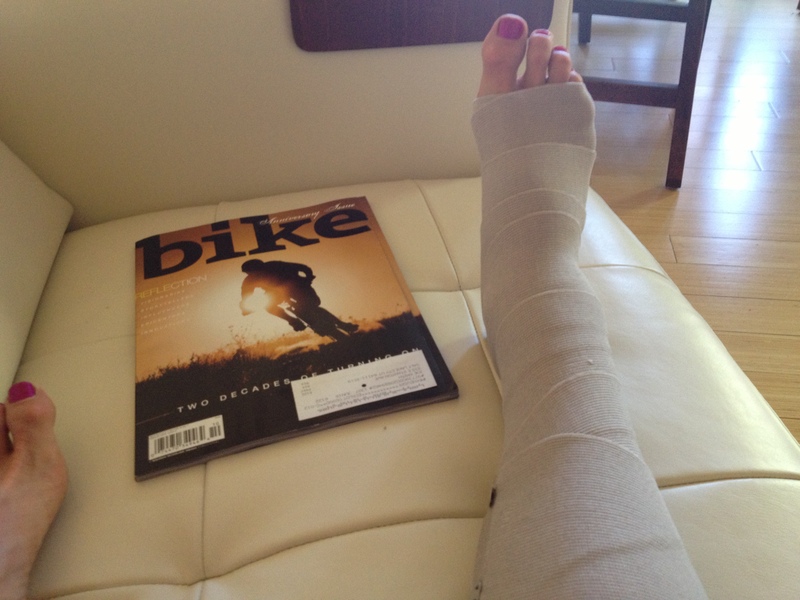 I carefully got back on my bike, rolled through the finish line and into the medical tent. The medical team repeated my assessment, decided I was just banged up, and sent me on my way with an ace bandage, ice and ibuprofen. Immediate Self Care for my Trauma Injury I strictly follow the RICE (Rest, Ice, Compress and Elevate) protocol after any trauma. Once home from my race I applied arnica, an herbal preparation that aids in inflammation reduction, and continued the RICE-ing through the evening. I was confident that the injury I sustained could wait until the morning for medical attention. It was possible that is was just really sore from impact, but I suspected that I had fractured my fibula. Day 2 Before I got out of bed I assessed my ankle and leg again. The swelling had increased, and bruising was apparent around my ankle and through my toes. My ankle was stiff, but I could almost move it through a full range of motion. Weight-bearing elicited the same level of pain as the day before. I begin RICE-ing again and called a sports medicine clinic to schedule some x-rays this morning. Diagnosis I had a stable distal right spiral fibula fracture. This means: I broke the bottom third of my right lower leg. It is stable, meaning that only one structure (bone or ligament) in the ankle complex is severed, and the other structures will maintain ankle alignment so that surgical stabilization (pins and plates) are not needed to allow the bones to heal. 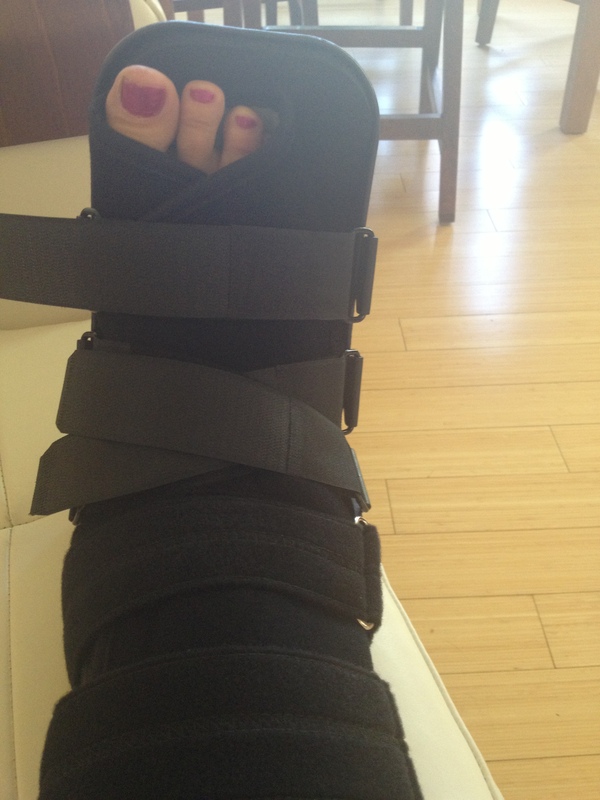 Because the fibula only bears about 20% of the body’s weight, a walking boot was all I needed for added stability. We decide to x-ray my injury again in two weeks to make sure the fracture is healing well and the ankle is still stable. Throwing Everything Into Healing I am a believer that to heal an injury best, you need to provide it all the nutrients and support it could possibly need. Now that I know what I’m dealing with for an injury, I can be active in my healing. Nutrition Healing takes a lot of energy (calories! ), this is the worst time ever to think about losing a few pounds. I often struggle to keep weight on when I am injured because so much fuel is needed to repair tissue. Bone requires minerals to rebuild. I take a bone-specific formula that has calcium, magnesium and potassium along with other minerals needed for bone remodeling. 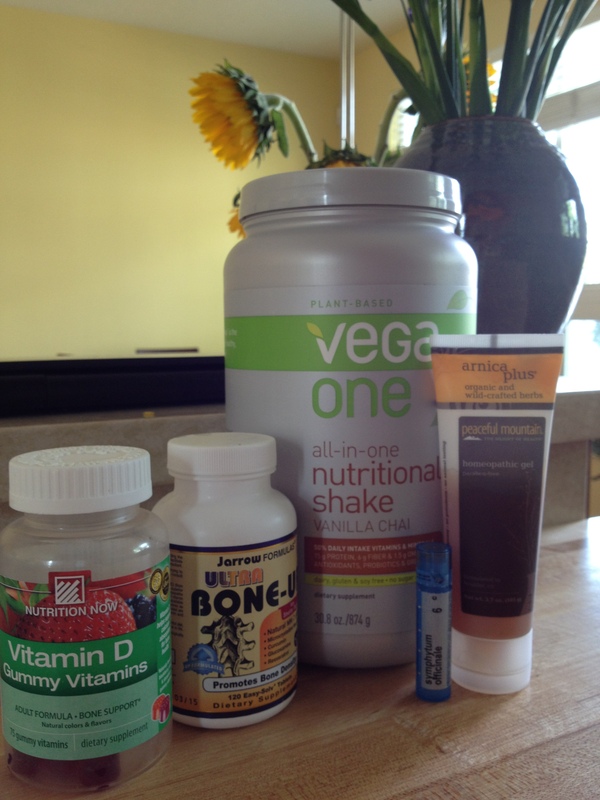 I also take vitamin D, which is necessary for the body to actually process calcium. Otherwise most of the minerals you are taking pass right through you! Just in case I’m missing some nutrient, I also take a multivitamin and fish oil. Fish oil is high in omega fatty acids, which work as an anti-inflammatory. In addition I take a homeopathic remedy for bone fractures (available at any holistic grocer). draining) therapy to my leg twice daily. MLD is a gentle massage technique that assists the lymphatic system to vacuum up the inflammation (bits of torn cells, blood leaked from capillaries, fluid, etc.). I applied kinesiotape in a web fashion to aid the lymphatic system and continue using arnica. Exercise No, I wasn’t about to get a cleat fitted for my boot so I could get back on my bike, but I did need to get my heart rate up! 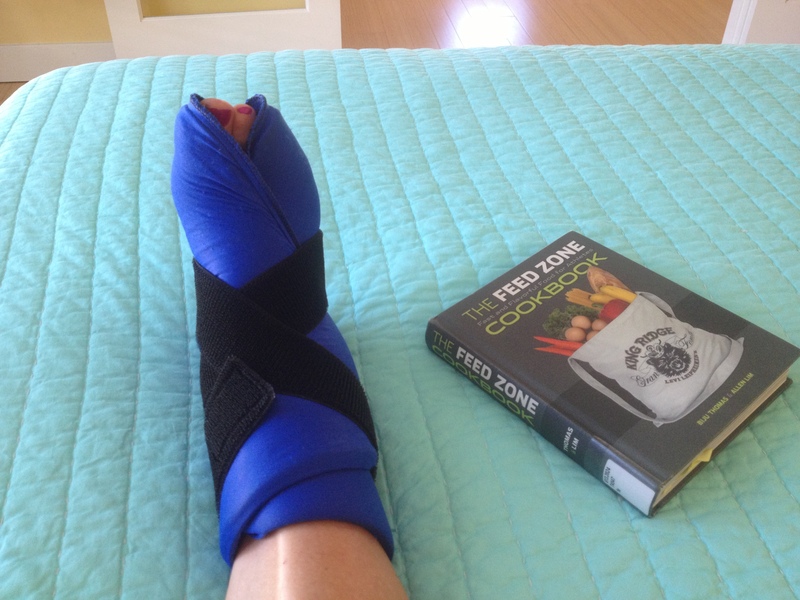 Yes, I was antsy to be active, but getting circulation cruising through an injury also helps push out inflammation and deliver the nutrients to where they are needed. I headed to the pool and put a buoy between my legs so I could swim with my arms and went to my favorite Pilates class where I modified any activity that might have compromised my injury. 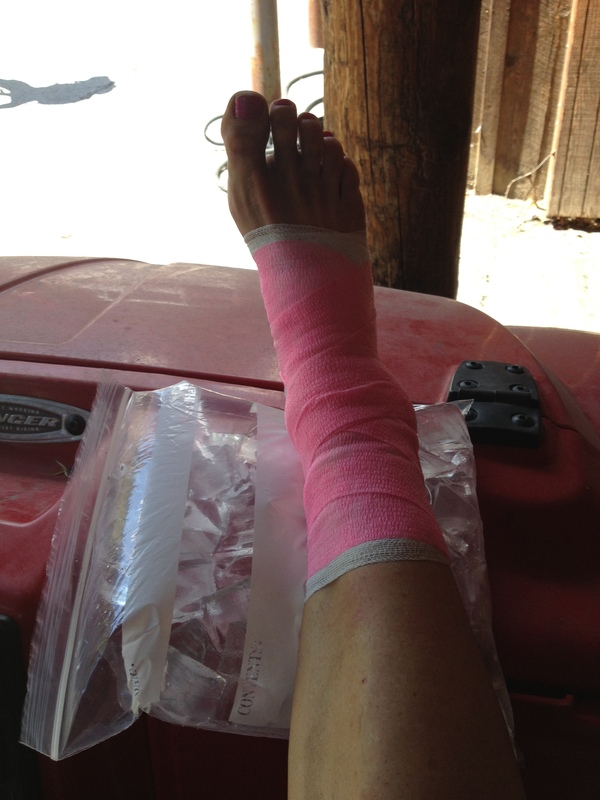 I also took my ankle through all its pain-free ranges of motion before I iced (which I did as often as I could). Day 4 At this point I was out of the acute injury phase, so I could start doing some real massage therapy on it. Daily I spent 30 minutes self-massaging all the soft tissue in my foot, ankle and lower leg. I was able to move inflammation out, gently move the joints my foot, treat sprained ankle ligaments, address trigger points in the muscles, and drive more circulation to the healing area. I also set up an appointment with my acupuncturist to help in pain management and aid in healing. Day 11 I had another visit with my sports medicine doctor to make sure we did not miss any serious soft tissue injuries (torn ligaments, tendons or muscles), to x-ray my leg again to make sure the fracture is healing in alignment and to check that the ankle is in fact stable. My doctor found that everything is looking great! Over the next two weeks I can start adding in some stationary biking, and two weeks after that I can start weaning off my boot. I should be back on my mountain bike in four more weeks, and my fracture will continue healing for 6 months before it is completely healed. I will keep up my regiment of home therapy and have scheduled physical therapy and massage therapy appointments to begin in two weeks. Every injury is different and has specific needs to heal. I hope this “diary” entry gives you a few ideas of what you can do to heal proactively rather than just waiting for your injury to heal. Being active in your healing process will improve your recovery and help you stay sane while you are side-lined! 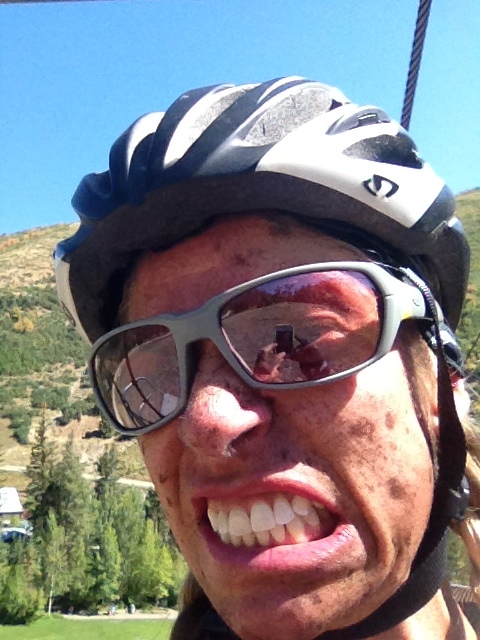 This entry was posted in cycling, General Info, Sports Injuries and tagged bone fracture, Injury care, trauma by focusbodywork. Bookmark the permalink.